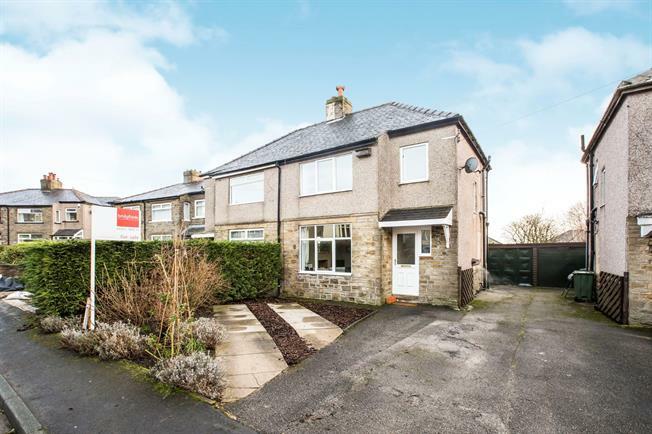 3 Bedroom Semi Detached House For Sale in Halifax for Asking Price £150,000. A simply stunning and beautifully presented semi detached property, that occupies a pleasant position on a nice quiet cul-de-sac and which provides everything you could ever wish to find in a family home, briefly comprising an entrance hall, a spacious lounge, a gorgeous fully fitted modern kitchen diner, 2 double bedrooms, 1 single bedroom and a stylish good size family bathroom. Externally the property boasts extensive mature and well maintained gardens to the front and rear, together with the added benefit of a detached garage and further off street parking. The property has the opportunity to be extended subject to planning. An early inspection is absolutely essential to fully appreciate what is on offer for sale. UPVC front double glazed door opening onto the garden. Double glazed uPVC window with obscure glass facing the front overlooking the garden. Radiator, carpeted flooring, under stair storage, dado rail, painted plaster ceiling, original coving and ceiling light. Double glazed uPVC window facing the front overlooking the garden. Radiator and log burner, carpeted flooring, painted plaster ceiling, original coving and ceiling light. UPVC patio double glazed door opening onto the garden. Double glazed uPVC window facing the rear overlooking the garden. Radiator, wood flooring, painted plaster ceiling, original coving, spotlights and ceiling light. A range of wall and base units with complementary wood work surface, inset sink, integrated oven and hob with over hob extractor, integrated dishwasher, space for washing machine and fridge/freezer. Double bedroom with double glazed uPVC window facing the front overlooking the garden. Radiator, polished floorboards, painted plaster ceiling, original coving and ceiling light. Double bedroom with double glazed uPVC window facing the rear overlooking the garden. Radiator, carpeted flooring, painted plaster ceiling, original coving and ceiling light. Single bedroom with double glazed uPVC window facing the front overlooking the garden. Radiator, carpeted flooring, painted plaster ceiling, original coving and ceiling light. Double glazed uPVC window with obscure glass facing the rear overlooking the garden. Heated towel rail, karndean flooring, tiled walls, painted plaster ceiling and downlights. Low level WC, panelled bath with mixer tap, shower over bath and pedestal sink.